Can’t measure up To the bravery of the Maid. What would it have been like to live at the close of the Middle Ages, in her case, 1413-1431, in a place that had been the pawn of rival forces between England and France? It’s impossible to know what Joan’s young life was like; no selfie’s, no text messages or even school scores to parse what her motives were. We do know that she liked doing needle work with her mother. That she took care of the sheep as did most youngsters. That she resented the opportunistic armies rampaging through fertile fields rendering them fallow. We know she imagined voices and saw saints. Did she really experience them? Is this possible? Imagine. 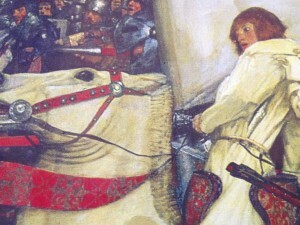 A young girl being charged with an army of soldiers. Imagine. This young girl did lead her army to break a year long siege. Her popularity grew. She spoke directly to God through her voices. The Church was threatened. Arrested, her documented trial is a testament to faith and determination, her spirit finally broken at the thought of being imprisoned for life, without a breathe of fresh air. She chose death and because of that achieved martyrdom and centuries of fame, sainthood. She has always held a place in my heart. Her simplicity, directness, courage and faith. Isn’t that a good enough reason to admire someone? I began to write Playing with Fire as a period novel, but the more I wrote, the more intrigued I became with how Joan might be received in contemporary society and the brilliant G.B. Shaw gave me a terrific opportunity to produce his play, St. Joan, in a book.